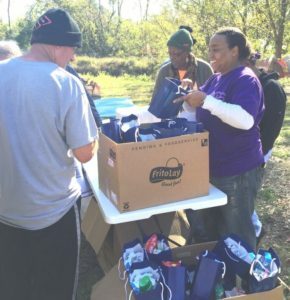 The Savannah program hosted their third annual Project Hope event, an initiative that demonstrates their commitment to the community’s homeless population. Staff set up tables at two separate homeless locations and provided lunch, hygiene products, scarves, pillows and blankets to about 50 individuals. Dismas and community partners made donations to make the event a success. “The recipients were extremely grateful and expressed their gratitude to the staff of Dismas Savannah,” said Director Katina Wheeler, who noted that staff and the homeless also joined hands in prayer. Above Resident Monitor Rene Williams passes out hygiene bags.